With costs that can easily reach into thousands of dollars a night, it’s easy to associate the notion of ‘going on safari’ with seriously big bucks. The most luxurious camps include the likes of suites draped in chandeliers, private pavilions and private pools – all accompanied by world-class wines and almost guaranteed Big Five sightings. Small and exclusive, these isolated camps can only be reached by buzzing prop planes that whisk safari-suited travellers off to a land of pillow menus and petal-bedecked beds. As incredible as it all sounds, I submit that the world of bucket shower simplicity is just as enchanting. 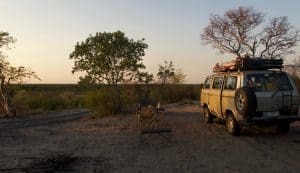 I’ve been on multiple seriously budget safaris around southern Africa, and here are my top tips for having the trip of a lifetime when you want to go easy on the credit card. Since the Kruger is the most accessible Big Five game park of them all – just four hours by car from Johannesburg’s OR Tambo International Airport – many people overlook it in pursuit of ‘something different’. What an error that is… The south of the park is easily reached, has the highest density of Big Five animals, and is subsequently the most popular part to visit, but it’s still worth driving through over a few days to reach the middle and upper reaches of this incredible park. While all the camps have basic rondavels and cheap camping pitches available, try and throw in a few Wilderness Campsites too: most are designed in such a way that you can’t see or hear any other campers when you’re stowed away in your segment. Head north of popular, sprawling Skukuza and up past Olifants, and you’re more likely to see an elusive leopard than you are another car. Some parks won’t let you in for perfectly legitimate safety reasons unless you have a fully equipped 4×4 (and incidentally, there’s no point heading off on a self-drive in one of these unless you have a clue how to use it… rather have a few lessons than end up in a situation that leaves you scared witless). I have driven, alone, as far north as Mopani in the Kruger in nothing more than the most basic hire car I picked up in Johannesburg. (Another budget tip: it’s sometimes cheaper to pick up and drop off hire cars at places other than airports.) Take a camping stove, a small mountain of pasta, enough eggs to feed an army, and you’re good to go. If you really can’t live without the likes of cheese for a few days, just pick up a coolbox and buy a bag of ice each day at one of the camps. Look at how long you’re going to be spending in game parks and see if it’s worth purchasing a Wild Card or similar. International visitors can pay around US$125 for the ‘international all parks cluster’ card that will grant access into over 80 parks and reserves throughout Southern Africa for a year; it’s over US$17 a day just to be in the Kruger, US$15 a day to be in the popular Addo, and more than US$18 per day to be in the Kalahari Transfrontier Park. The card even includes access to the likes of the stunning Cape of Good Hope and the adorable Jackass Penguins at Boulders Beach. Botswana is notorious for having some of the most expensive game viewing in Africa, and with good reason: it’s fabulous. 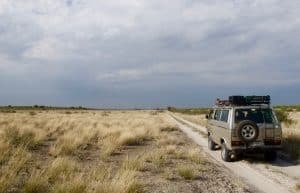 But if you can get hold of a decent 4×4, you will have an amazing trip in the Central Kalahari on next to nothing. Don’t undertake such a venture lightly: I’ve seen a brand new Toyota Hilux abandoned in the middle of nowhere – presumably by newbies who became overwhelmed – and heard countless stories of people being stuck on the pans for days or even weeks at a time until help happened to arrive. 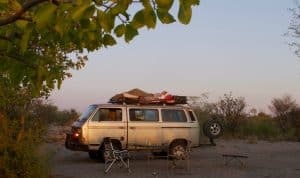 Park fees are around US$14 a day, and international visitors must pay up to US$20 a day for camping – and for that you get… nothing. Sometimes, you’ll have a drop toilet and a hanging bucket with a hole to use as a shower. Once in the park you must be completely self-sufficient, with no water, fuel or food available. I can assure you, though, that the night I camped with over 20,000 square kilometres of wilderness all to myself wouldn’t have been made better by a private terrace and a butler opening my wine. I took my Pimm’s out of the fridge, lay back under the stars on a mattress that I’d hauled onto the roof, and the rest of the world just faded away. For less than US$50 a day, I got to be the luckiest girl in the world. Nobody actually thinks of going to Vwaza Game Reserve in Malawi because nobody has heard of it. It’s a mistake to overlook such random little parks, though, since they are invariably absolute gems. I hitched out to the park and ended up staying in a small hut in view of the lake, where hippos idled around a few hundred yards from me. For an extra couple of dollars a day, I happily handed over my meagre stockpile of food to a ‘private chef’ who cheerfully pedalled off to have a bath before he moved into the kitchen – ‘that’s the first thing I learned in cooking school’ – and dined on infinitely better dishes than I’d ever have conjured up in that dusty little vestibule. Less than US$10 a day included everything from game drives to guided walking safaris. Out of the Big Five I may have only seen a herd of buffalo, but there’s infinitely more to Africa than lions draped sleepily across tree branches. 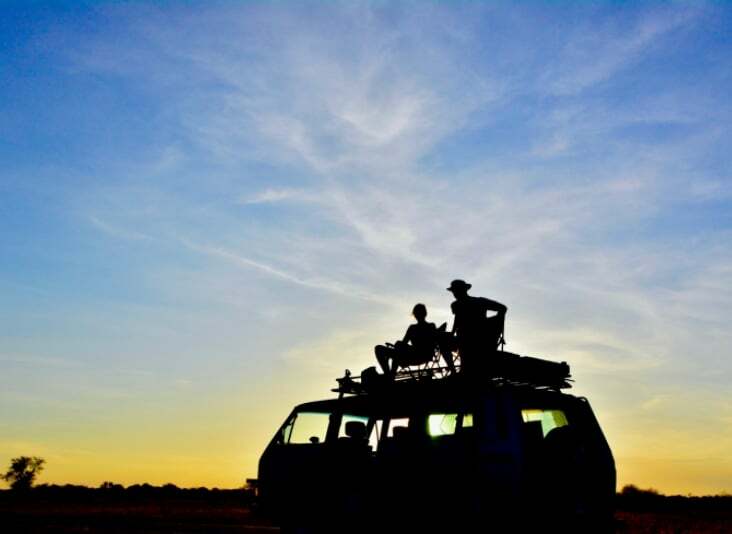 It’s a genuinely pertinent point: ask yourself what you actually want to get out of a safari. Do you want to see the Big Five? Live in the wilderness? Have a penchant for elephants? If you’re an active sort, will you go mad just driving around for hours on end each day with no chance to exercise? Look at all the options out there: maybe you don’t need to spend so much time in one of the more expensive parks after all. Maybe it’s cheaper to stay outside the park and drive in every day. The more people you go with, the more costs such as hire vehicles and fuel are lowered. The more you can cook for yourself, the less time you’ll spend eating out in restaurants.